In this article, drones or robotic vehicles, will be compared to real-life unmanned combat drones. Unpiloted robotic vehicles have shown up throughout all three universes in numerous iterations. Some vehicles in the series may be robotic, but aren’t defined as such or are intended to just be pilot-assisted. Only vehicles that are clearly unpiloted will be mentioned here. 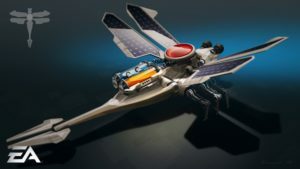 Although unmanned combat drones are currently fielded in real wars, the Command & Conquer series features a much wider variety, so how do these compare with current technology or developments within the near future? 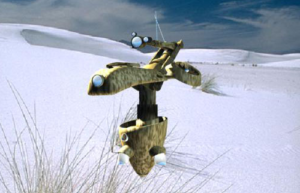 The first drone to enter the games was the Hunter-Seeker Droid in Tiberian Sun. A minor super weapon, this was a drone that automatically targeted one random enemy and impacted with them, instantly destroying both the target and the droid. These attacks were not significantly useful in the game and attacking targets at random would be downright unacceptable in a real battlefield scenario. It is more or less a very unreliable guided missile, and since guided missiles already exist and are more reliable, there is no reason to replace them with Hunter-Seeker Droids. Of course, as guided missiles become increasingly advanced, there may be some threshold nobody will notice was crossed, in which a missile is more of an automated self-destructing robot than conventional ordinance. Whenever that line is crossed, they won’t be equal to the droids of Tiberian Sun though, they will be much better. In the Firestorm expansion, the second unpiloted robots came in the form of Limpet Drones. These devices deployed into mines that sabotaged their victims’ speed and cleared the fog of war around the infected unit. The potential to spy on an enemy’s base by planting a surveillance device on their vehicles would be very useful in real-world scenarios were intelligence gathering is a much more critical component to strategy. Unfortunately, reducing a vehicle’s speed by half is an excellent way to make them suspicious. Espionage is usually more effective when the enemy isn’t aware you are spying on them. It is possible a similar reconnaissance drone may come into existence, or already does exist, but if it is working as intended, nobody will know about it. The infamous Terror Drones, like the Hunter-Seeker Droid, seem like a more complicated way to do the job of a guided missile, except perhaps with even lower effectiveness. Chaos Drones were a form of chemical warfare, where it might make sense to deploy hallucinogenic gasses from a machine that can’t be affected by its own weapon. This deployment method would have an advantage over a chemical bomb in that it can keep emitting the gasses over time instead of releasing them all in a single burst. It is still a chemical attack however, and chemical attacks are notoriously ineffective. Such a drone would only be useful in a terrorist attack, where fear is more important than casualties. It is possible that when drones become more commonplace, a chemical drone of this type may be deployed as an act of terrorism, but it is unlikely any conventional military force would use such a device. Generals featured more drones than any other game in the series, many of them inspired by real-world drones. The Spy and Scout Drones are just basic reconnaissance UAVs and the Hellfire Drone is a combat drone, all based on real technology. Interestingly, the model for the unarmed Spy and Scout Drones seems to be the MQ-1 Predator, which is a combat drone that carries hellfire missiles. The Battle Drone upgrade is a repair drone with a gun. The machine seems too poorly balanced to boast a gun, but the repair mechanism is the more significant and interesting part. Tiberium Wars and Red Alert 3 also had repair drones fly around factories to fix nearby damaged units. While these drones would be undoubtedly useful, it is highly unlikely we will ever witness such technology within the foreseeable future. Maintenance is a huge concern in the real world, where merely getting a combat vehicle to the battlefield without it randomly breaking down multiple times is an issue long before patching a gaping hole in the wall from an enemy round. In tank crews, the driver is also usually a mechanic who performs daily maintenance on the vehicle. Unfortunately, repairs are often long and difficult jobs that require spare parts, not something that can be done with a few quick spot welds from an airborne drone. Sentry Drones are similar to Limpet Drones in that they are surveillance devices that can completely give themselves away to the enemy. The Sentry Drone may be slightly less useless in this respect, since it can drive to a new location after opening fire, assuming it actually survives the encounter. Of course, even if it does reposition itself, the enemy has been alerted to the presence of the drones, which will be a good thing if your goal was to slow down their troop movements, but not so much if the idea was to use a surveillance drone for surveillance. As a side point, automated sentry guns have been tested in real life and were very effective – at wasting ammunition in the absolute indiscriminate extermination of all local wild life. 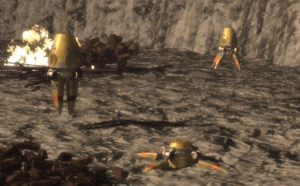 Burst Drones from Red Alert 3 were the series’ final foray into making surveillance drones as ineffective at performing their primary function as possible. As an added bonus, when inevitably spotted by enemy, they could self-destruct. This allowed them to be more useless than both a dedicated surveillance drone and a guided missile in one tiny dragonfly-shaped package. At least they were kind of cute in a don’t-look-at-it-too-closely sort of way. It is likely that the Red Alert 3 Aircraft Carrier was designed to launch Sky Knight drones instead of regular jets so that it could be made much smaller without looking ridiculous, but smaller carriers built specifically for drones is something already being considered by real militaries, so the concept in general is fairly close to near-future expectations. 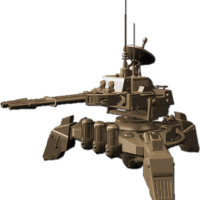 The Robot Tank, Mantis, and Future Tank X-1, as well as some of the other drones mentioned above, are ground combat drones instead of the more relatable flying drones. Drone tanks are extremely uncommon in the real world, even in the largest and most technologically advanced military forces. There are several good reasons for this. Drones can be controlled over transmitters from the ground, but terrain and buildings can weaken or block the signal, so they are usually piloted over a satellite. This is also useful to prevent jamming signals from the enemy, since the drone can be designed to block out all transmissions that do not originate from above it. For a ground-level unit, almost everything is above it, so it cannot easily ignore jamming signals. Satellite transmissions also have a small latency, which for a drone aircraft that just has to fly to a specific location and drop its ordinance before flying home, this isn’t a major issue. For a tank on the battlefield, it would be. Tanks also generally do not roll into battle alone, they go in with infantry support to protect them from enemies they cannot easily engage and are vulnerable to, like soldiers equipped with anti-tank missiles. Since the whole point of using a drone in the first place is to keep humans out of danger, requiring a drone to be accompanied by humans is not ideal. It is probable that drone tanks will become a viable combat unit at some point in the future, but not any time soon. Flying drones in the sky where there are few obstacles, threats, civilians, or other unpredictable issues is far simpler.